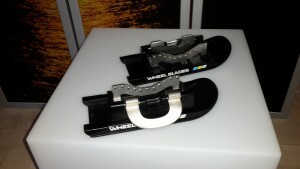 The Wheelblades S are the everyday solution for the snow from Otto Bock. I went to the Snow Dome in Bispingen (Germany) to try them out. Jammed the skis on- and off to the snow fun.The Blades worked really well for all the bumps and partly loose snow. No sinking into the snow with the small front castors anymore, and what I really liked about them was the easy handling. Set the width as you need it, slightly tilt the front wheels up, position the castors in the binding and fold up the clamp: done! 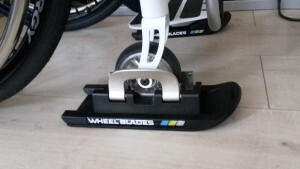 The Wheel Blades are only limited by deep snow, hard particles such as loose chippings, rocks or snow-free sections and by the tires of the big wheels. You can see at the end of the video that I can’t move on in the deeper snow, because my tires loose grip. This happened to me also earlier when I tried to reduce my speed a little down the hill. Wider tires with more grip are highly recommended! You should also look out for snow-free sections, because the little ski will turn sideways and stop right away. Not a big problem though, because they are easily taken off and stowed in a backpack. While you drive them, make sure that the skis don’t lose contact to the snowy ground, because they can turn to a wrong position when you set them down again. Before using, please read the instructions and warnings coming with the wheelblades. Information: The Wheel Blades can be put on with a snap lock under the front castors. 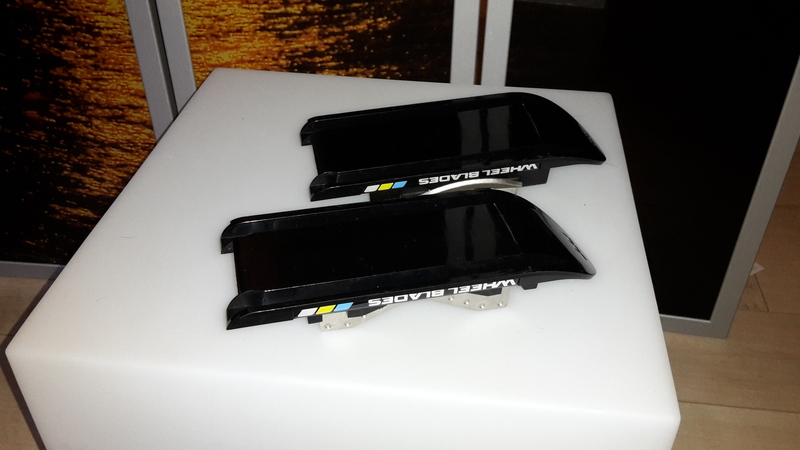 The bindings are easily adjusted (with the included torx key), you can set the width from 2cm to 6cm and use wheel diameters between 80mm and 200mm. The blades are smooth like a ski on the bottom and have two folds inwards, ensuring that the skis stay on track and maintain the direction you choose in the snow. One single ski weighs 0.5kg, is 25,8cm long, 11cm wide and 5,2cm high. 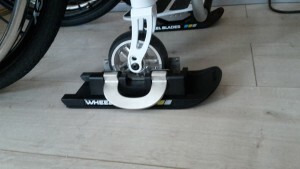 The Wheel Blades are also available for wheel sizes of walkers and strollers. The Wheelblade S for wheelchairs cost around €289.